Blazing hot summer days calls for cool fashion. I think this brand new release from the talented Mimikri perfectly fits the bill. The off-the-shoulder, embroidered peasant-style blouses are so pretty and they look perfect paired with this frayed bottom cotton denim skirt. Please note, I’ve paired the pebble colored skirt with the studded belt form the Skye Azure color. It’s available at the latest round of Tres Chic, which starts June 17th. Also new is this pretty hair style from Mina Hair. This color is from the Blondes Pack. What you can’t see is the back, which has a pretty braid detail. 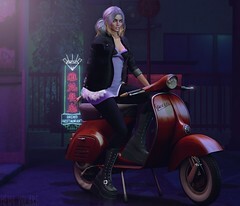 You can pick up this hair at the Good Vibes Fair which is on until June 29th.